Well well well… A MolsonCoors beer has made into Home Sweet Hell (my house). I am a beer drinker who is against the Big 3 (Anheuser Busch, Miller, and Coors), and will usually not support beers brewed or bought out by these guys, unless, like in this case, they are disguised, hiding behind a craft beer label. Oh well, I never thought I’d have to sit at the store and read the entire label from front to back to make sure I am not giving money to these bastards! Poured into my Ranger Creek pint glass. The beer is a light brown color with a very thin cream colored head, which disappeared quickly, and left no lacing on my glass at all while drinking. The aroma of this beer was definitely not the usual hoppy-ness of an American style IPA. This one had more of a biscuit like smell, with a slight peppery finish on the nose. The taste of this beer was also a bit of a surprise. I am so spoiled on the taste of American style IPAs brewed by American breweries that are usually very hoppy with characteristics of whatever hops they used. For an IPA, this one was very malty, reminiscent of an Amber or Brown Ale. I taste hints of grain, bread, and spices. I wasn’t too impressed at all by this beer to be honest, as said before I was expecting hop aromas and flavors to be kicking me in the throat. Now I have done some research on this beer, especially after I found out that it was owned by MolsonCoors. 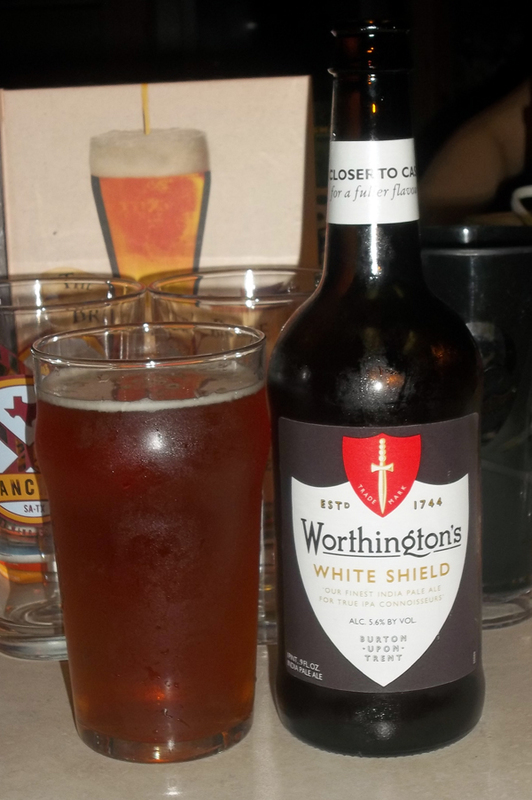 I have discovered that Worthington’s White Shield IPA is said to be the longest surviving India Pale Ale due to the fact that this beer dates back to the 1820s. It is noted that this beer is brewed to the same recipe as 1830. White Shield is one of UK’s most heavily decorated beers, as they have won several CAMRA (Campaign for Real Ale) Awards, 9 to be exact. Last interesting fact about this beer I found out was that production moved from White Shield brewery to William Worthington’s brewery in December 2010. Production moved to the main Coors brewery in Burton in 2012 to keep up with increasing demand. Overall I will give this beer a 2.5, right in between 2 SKULLS = Will drink again if someone bought it for me and 3 SKULLS = Right up my alley, average beer which I will drink again! So buy it, try it, and let me have a glass, I guess!